Melting the polar ice cap and drilling for oil where the ice used to be would be crazy and wrong, even if we needed the oil. We’re obviously not about to quit using oil right away. But Arctic drilling isn’t about to produce oil right away either; it’s too remote and expensive, and we’re awash in cheap oil. So how much do we need? For how long? At what cost? And how fast will we develop better alternatives that free us from oil dependence? These questions have right and wrong answers – answers that either give our kids a fighting chance for a healthy future, or toast them. And once we answer these questions, Arctic drilling makes no kind of sense. Why is Shell moving ahead with drilling, when other major players have abandoned Arctic exploration? With billions squandered already, Shell seems to think it's in too deep to get out. First, let’s dispense with the silly strawman. (For Pete’s sake,) Shell protesters are NOT, as former Republican Party Chairman Chris Vance said on KUOW’s Week in Review, suggesting that we “abandon all coal, oil, and gas tomorrow” (emphasis his). We’re talking about a transition that occurs over several decades, quickly enough to prevent climate disruption from spinning out of control. And that means we have to live within a carbon budget – a specific, well-documented amount of emissions beyond which climate disruption is likely to become unmanageable. Proven fossil fuel reserves are roughly enough to produce 3 to 5 times this amount. The rest of it has to stay put. We are screwed. We are going to completely fail to save ourselves from climate chaos, allowing oil production to bust the carbon budget by a factor of 3. Over that time, civilization will be falling apart, with massive food and water shortages, millions of climate refugees, and coastal cities disappearing under acidified oceans. But somehow, we will manage to keep stoking the flames with more and more use of increasingly expensive fossil fuels, even as economies falter and roads slip under the sea. And while this crisis deepens over a period of decades, we won’t make the transition to better, more economical, healthier ways to provide energy and transportation service. We won’t innovate. We won’t learn. We won’t change. We won’t even adopt the clean, affordable technologies we have now. We won’t rein in the power of fossil fuel companies, even as we lose everything dear to their greed. We’ll just keep letting them dig and drill and burn. This dystopia is as implausible as it is ugly. We may be slow on the uptake, but c’mon, we’re really just going to sit there and watch this run us over? How would we even manage to keep burning fossil fuels under these conditions? But again, you have to believe this nightmare – to accept it – in order to make “sense” out of Arctic drilling. If we don’t go there, there’s no market for Arctic oil. Why, then, is Shell moving ahead anyway? It’s a damned good question, one that Shell’s investors are surely scratching their heads over now. Other oil majors have pulled out of US Arctic exploration. And the financial community is increasingly wary of additional capital expenditure to develop “unburnable” reserves. If they could start over now, it’s hard to believe they’d do it; but with billions squandered already, Shell seems to think it’s in too deep to get out. And this is what’s already happening. Think what we could do if we put our minds to it. Think about how much freer, healthier, and more prosperous we could be if we had better transportation choices…. if we didn’t have to strap ourselves – physically and financially – to a 2-ton steel box powered by exploding oil sold by tyrants in order to get our 150 pound hides to the store or the soccer game. If you can afford a car, you can afford an electric Nissan Leaf. If you live in Seattle, it will give you about 90 miles of transportation service for less than 2 bucks’ worth of carbon-free City Light electricity. That same 90 miles would cost you about $10 and produce 60 lbs of CO2 in a gas-powered car that gets 30 mpg. You can send $10 to the Koch Brothers or Exxon-Mobil’s Rex Tillerson for oil, or $2 to your local public electric utility, and keep $8 for whatever. “Whatever” (food, clothing, music, beer…) will create far more local economic opportunity and jobs than oil, plus a bonus: it won’t be used, like oil money, to stack Congress with climate deniers or peddle climate science doubt to school children. With more charging infrastructure and better batteries, why would anyone go to a Shell station again? 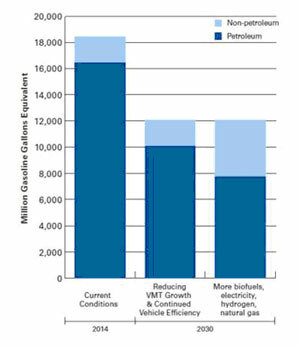 We can untie the knot this way: We will use oil today, and tomorrow, and for decades – up to almost a trillion barrels. But in the 2-4 decades it takes to use that oil, we can also make a steady transition to a clean energy economy, and move on from petroleum, as we moved on from whale oil before it. Instead of using fossilized, canned sunlight, we can use the fresh stuff, and use it much more efficiently. We have to, if we want our kids to have a decent future. We know how. We’ve already begun. The Polar Pioneer is a desperate attempt by Shell to stop this transition – to lock us in and squander our energy dollars on prolonging our oil dependence and Big Oil’s profits. The closer they get to that “unburnable” Arctic oil and the more they spend trying to develop it, the harder they will have to fight to obscure climate science, squelch alternatives, and muzzle our democracy to make sure we have no alternative but to burn it. So today, it’s “Shell No,” to keep them from destroying our opportunity to build a livable future. But every day, it must be Hell Yes to the transportation and energy choices that make that future real. This doesn’t even count Arctic oil and other deposits that are not yet booked as proven reserves. The Nature study that makes this argument assumes that expensive oil will generally stay put as long as there’s cheap oil to meet demand. This assumption obviously ignores the important role of geopolitics in oil markets, but ultimately, it’s awfully hard to sell expensive oil when there’s so much cheap oil that can outcompete it. You could say that’s cheating, since I’m using cheap Seattle hydro. OK, say you produced electricity for your car with solar panels at, conservatively, 25 cents per kwh. Then your 90 miles would cost you $4.50 – maybe half what you’d pay for comparable oil-powered transportation. And while solar costs are plummeting, gasoline produced from Arctic oil would be much more expensive than today’s fuel. Even the conservative IEA says solar costs are headed toward 4 cents/kwh. With 4 cent solar, your 90 miles will run you $0.72. With $5 gas, it’ll cost $11.25. And that’s a decent guess at where prices would be by the time Arctic oil reached consumers.